President Trump fired off a fresh barrage of tweets against former FBI Director James Comey on Sunday, continuing his assault on the man he fired ahead of the release of Comey's explosive new memoir. Mr. Trump's early-morning missives slammed the ex-director as a "slimeball," while simultaneously casting Comey as someone he "hardly knew." The Twitter spat comes as an interview with ABC News' George Stephanopoulos is set to air on Sunday night, in which Comey will discuss details from his new book, "A Higher Loyalty: Truth, Lies and Leadership," which goes on sale Tuesday. In a clip from the ABC interview released on Saturday, Comey said his belief that Hillary Clinton would win the 2016 presidential election was a factor in his decision to disclose the investigation into her use of a private email server as secretary of state. Mr. Trump responded on Sunday, criticizing the admission and calling Comey a "slimeball!" "No golf and grandkids talk (give us all a break)!" Mr. Trump added, in a jab at Lynch and Clinton's claims that Clinton saw the attorney general on the tarmac and boarded her plane to say hello. Besides taking a break to tweet on the U.S. coalition air strike in Syria, saying his call back to a Bush-era phrase "mission accomplished" should be "brought back," the president disputed ever asking Comey for a loyalty pledge, despite Comey testifying before Congress that he did in fact ask for such an oath during a private dinner at the White House. 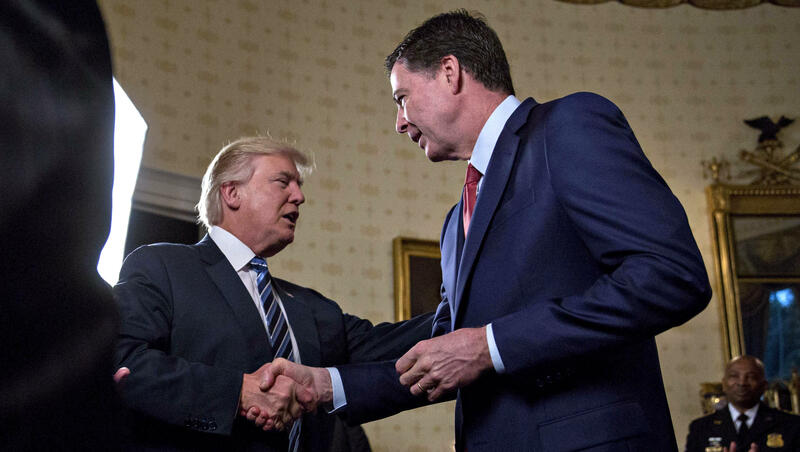 Mr. Trump delivered a final jab at Comey, criticizing his intelligence and saying he will "go down as the WORST FBI Director in history, by far."